Transform The returned child transform or null if no child is found. Finds a child by n and returns it. If no child with n can be found, null is returned. If n contains a '/' character it will access the Transform in the hierarchy like a path name. Note: Find does not perform a recursive descend down a Transform hierarchy. //Finds and assigns the child of the player named "Gun". //If the child was found. //Find the child named "ammo" of the gameobject "magazine" (magazine is a child of "gun"). As described Find does not descend the Transform. Find will only search the given list of children looking for a named Transform. A GameObject with three children. Find() does not find the third child. 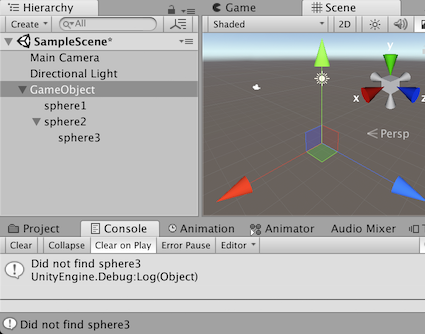 // ExampleClass has a GameObject with three spheres attached. // not find this child.